It is easy to forget that R.M.S. Titanic, for all its fame and reputation as an unsinkable marvel unlike any ship the world had ever seen, was actually the second of three Olympic class vessels. Titanic was the first of them, but not the last, to sink with the loss of life. R.M.S. Olympic was the original. Documentaries on Titanic often make use of material that was actually taken on Olympic. One ubiquitous shot is of Captain E. J. Smith, who was the commander of Olympic before he took Titanic on her maiden voyage and lost his life. An item in the British Pathé archive listed as containing Titanic footage actually contains shots of Olympic (and other vessels). The exteriors of the ships are indeed extremely similar, but there are telling differences in the design of the A-Deck windows. Captain Smith standing on the bridge of Olympic. This photograph is often used to illustrate Captain Smith onboard the Titanic, an incorrect statement that even the canister notes of this British Pathe newsreel claim. Olympic’s maiden voyage was in 1911. That same year, with Captain Smith commanding (and held accountable by an inquiry), the ship crashed into a Royal Navy cruiser called H.M.S. Hawke. Olympic required extensive repairs. Titanic sank on its maiden voyage in 1912. That story need not be retold here, but it had a substantial impact on Olympic and Britannic. The media storm resulting from Titanic’s insufficient number of lifeboats led to a mutiny by those serving on Olympic who, quite understandably, refused to sail on her before she was fitted with enough lifeboats for the number of people aboard. Britannic was still under construction at this time, but both she and Olympic were fitted with an inner skin for added defence in the event of a collision and with watertight bulkheads that went higher up the ship than those of Titanic. Britannic was launched in February 1914. There is no denying her beauty, but Britannic would never carry her intended passengers on luxurious ocean voyages, for the First World War intervened. Olympic was commissioned to carry troops and earned for herself the nickname “Old Reliable”. Britannic meanwhile was converted into a hospital ship. For this purpose, she was painted white, with the traditional red crosses along her hull. In 1916, H.M.H.S. Britannic met a similar fate as her infamous sibling. She struck a mine near Greece and sank. Amazingly, on board was Violet Jessop, a Titanic survivor now working as a nurse (she was also, bizarrely, aboard Olympic during that ship’s collision with H.M.S. Hawke). Captain Bartlett had ordered the ship to continue, hoping to run her aground, but confusion among the crew led to lifeboats being lowered while the ship was still moving. This caused two of the lifeboats that reached the water to find themselves in the path of the propellers. Thirty were killed as the tiny wooden boats were churned to pieces. The remaining passengers and crew survived, along with the Captain, who swam to a lifeboat when the bridge sank from under him. The wreck of Britannic was discovered in 1975 by Jacques Cousteau. Lying on her side under only 400ft of water, she can be visited by divers using only scuba gear. In May of 2009, Britannic claimed another life when Carl Spencer was killed diving at the wreck site. Olympic continued to sail as a passenger ship long after the end of the First World War. The British Pathé archive contains an interesting little feature on the Prince of Wales (the future Edward VIII who famously abdicated and married Wallis Simpson) travelling on the ship in 1924, where he talks with Captain Howarth. Captain Howarth and the Duke of Windsor (then Edward Prince of Wales) onboard Olympic in 1924. In her twilight years Olympic was still not free from the Titanic curse. In 1934, under the command of Captain John Binks, the ship ploughed into the tiny U.S. lightship Nantucket, causing considerable damage to the smaller ship, far more than it did to the colossal luxury liner. The unlucky Nantucket sank in just thirty seconds. 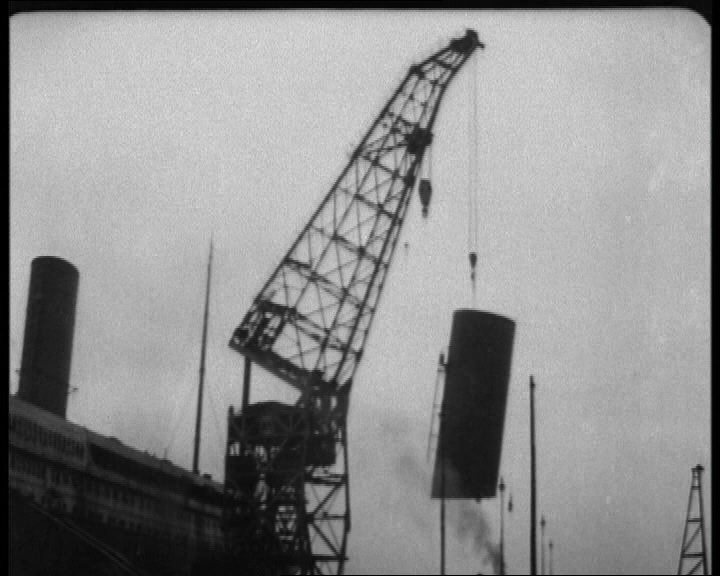 A contemporary newsreel makes for interesting viewing. Captain Binks, looking as though he has been through the worst experience of his life, puts on a brave face while the wounded survivor of Nantucket standing beside him commendably absolves the Captain for his actions in the aftermath of the crisis. The end of Olympic was a rather quiet one. No longer profitable, she was scrapped in 1935. Many of her interior features found their way into hotels, but it is undeniably a shame that she is not still with us intact today. Even in 1935, Titanic was a famous ship with books, plays, and films already produced documenting her story. Olympic would have made quite a museum and monument. Titanic’s centenary will not go unnoticed by anyone. The anniversary of Britannic’s demise is unlikely to engender the same degree of public interest or media attention when it arrives in 2016. Nor is the anniversary of Olympic’s sad fate (2035). But these ships had interesting stories too, made all the more so by their close relationship with what has been called the most famous ship since Noah’s Ark. You can visit British Pathé’s clips related to Titanic and her neglected sisters here in a collection that is, rather tellingly, titled only “Titanic”. Previous Previous post: Balloon Boy Found! Next Next post: Vintage Sports Videos – New Uploads!